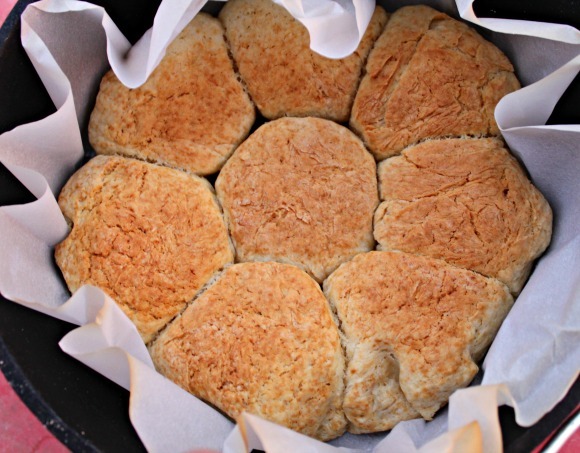 I really love biscuits, but I’ve always been a little too intimidated to try them from scratch while camping. I usually just grab some of those canned ones and haul those along in the cooler. 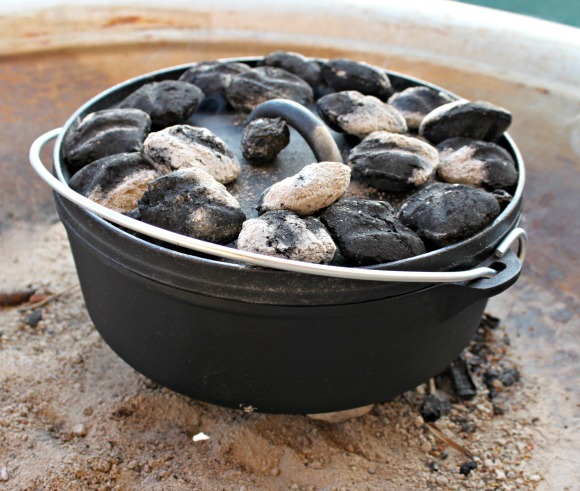 But now that I’ve got a dutch oven – I decided it was finally time to give them a go. I can’t believe I wasted all those years on canned biscuits. 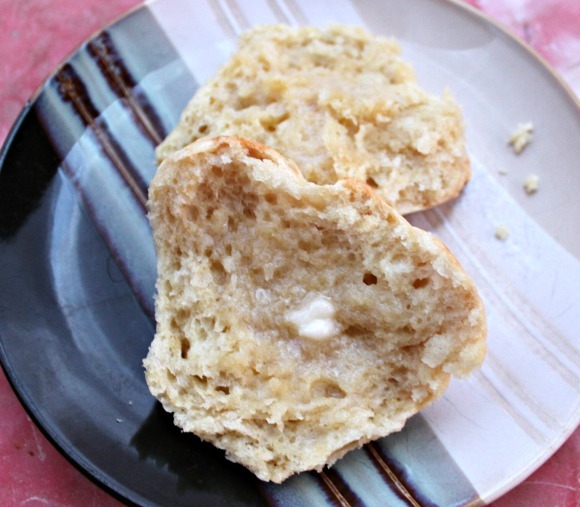 Scratch biscuits are easy and super delicious! This recipe makes about 7 large biscuits. 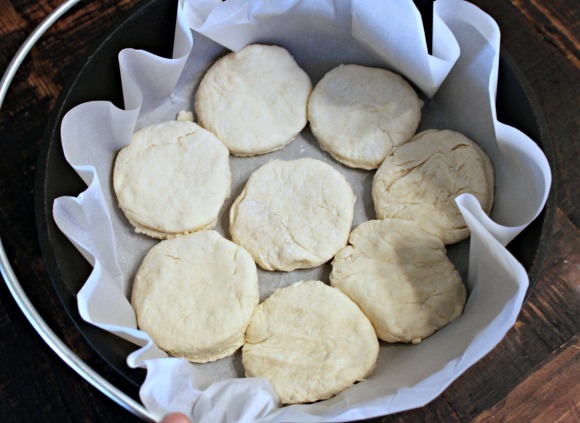 You can either choose to use parchment paper to line your dutch oven or you can simply grease it with a little bit of butter so your biscuits don’t stick. I highly recommend the parchment paper for easy clean up! You can do pretty much all of your mixing of ingredients at home so your only job at the campsite will be to add the buttermilk and roll these puppies out. 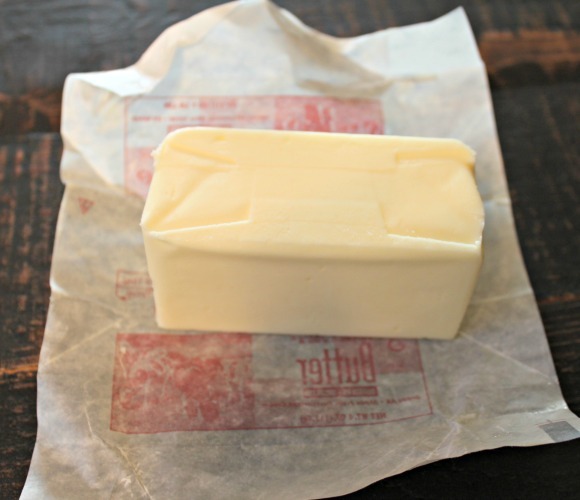 Take your stick of unsalted butter and cut it into smaller pieces. Then, add it to your dry ingredients. 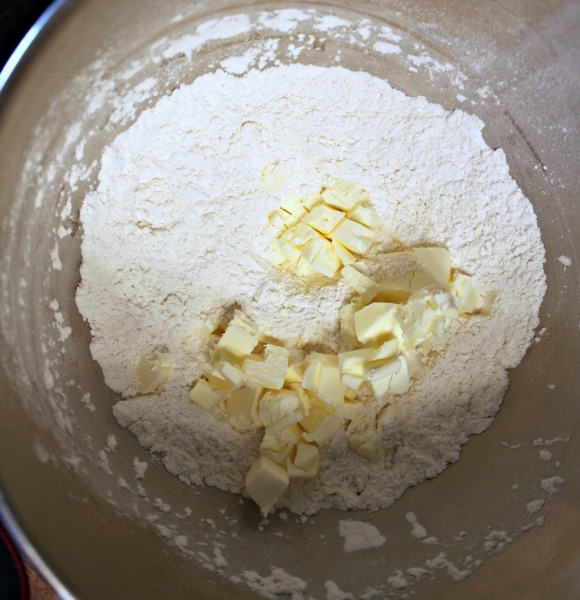 Then you’ll take a fork (or a pastry cutter if you’ve got one) and simply mash the butter into the dry ingredients. You want the butter to eventually be very small pieces – sort of like crumbs. This will keep your biscuits nice and light since that butter will melt into little pockets of goodness when you bake them. 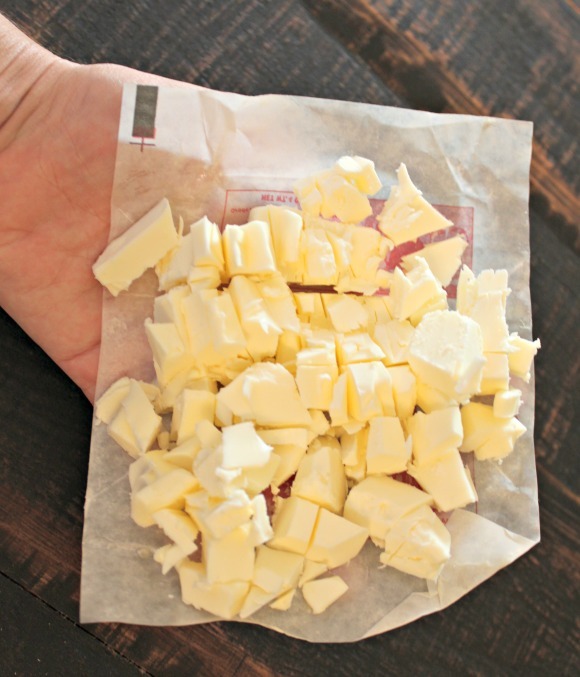 Once your butter is crumbled into your dry ingredients – simply bag the contents of your bowl into a zip top plastic bag and refrigerate until you’re ready to put it in your cooler for your camping trip. Get your charcoal briquettes heating up. You’ll want 24 total – put them in a heap and light them. 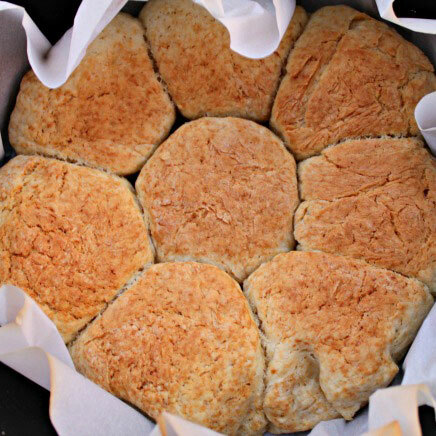 You’ll let them heat up while you roll out your dough into biscuits. Remember – you want white-hot briquettes. Once you’re at the campsite you’ll want to mix your buttermilk or milk/lemon juice or vinegar mixture into your dry ingredients. But first let me explain the milk/lemon juice or vinegar thing. 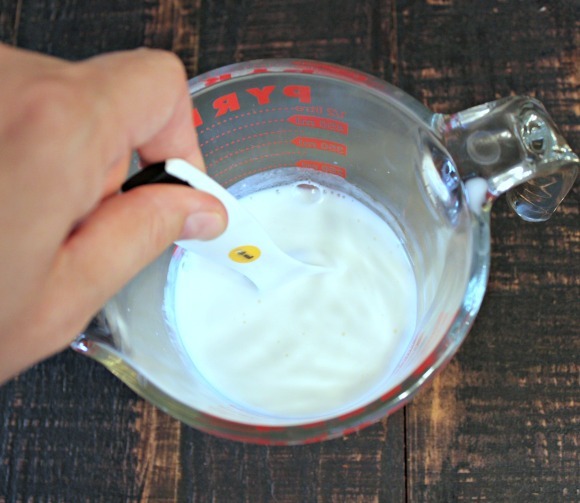 If you’re like me and almost never buy buttermilk because recipes call for a tiny amount and too much buttermilk simply goes to waste – you’ll love this little trick. Say your recipe calls for ¾ Cup of buttermilk (like ours does above.) 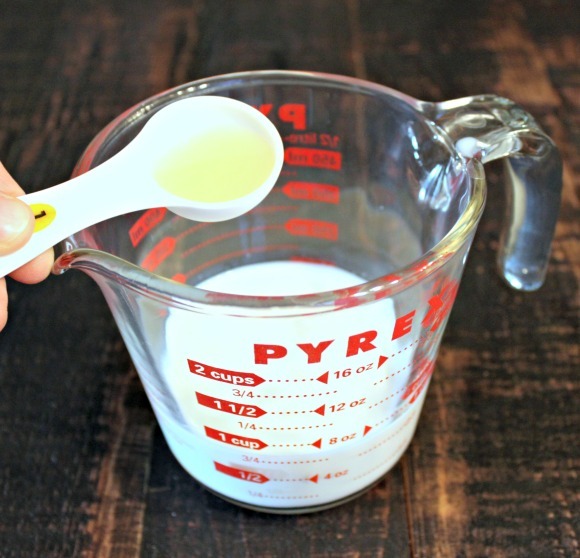 Pour ¾ Cup of milk (shy just a tiny bit to save room for the other liquid) and add a teaspoon or so of either lemon juice or vinegar. Stir this up and let sit for 5-10 minutes. 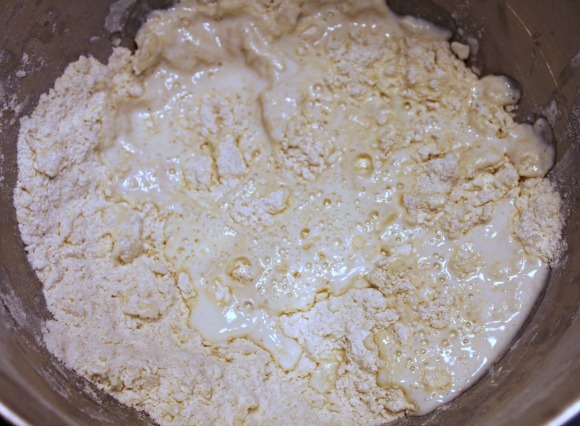 Now the milk mixture will act exactly like buttermilk and you don’t need to buy buttermilk. Awesome right? Now we’re ready to add the pseudo-buttermilk to our dry ingredients. 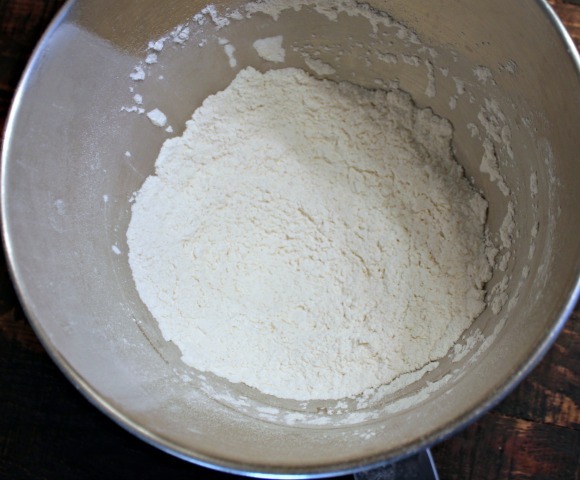 Or if you brought buttermilk instead – just put that in – no need to do the milk prep step! See all those bubbles? 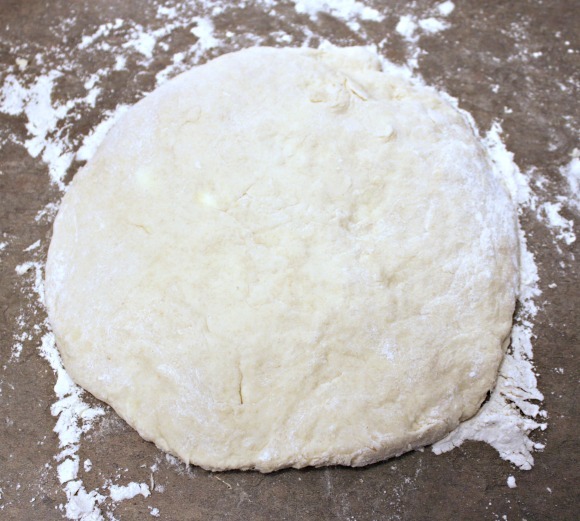 Once you have thoroughly mixed the milk and dry ingredients – you’ll want to make a rough circle with your dough on your cutting board (or other flat surface). 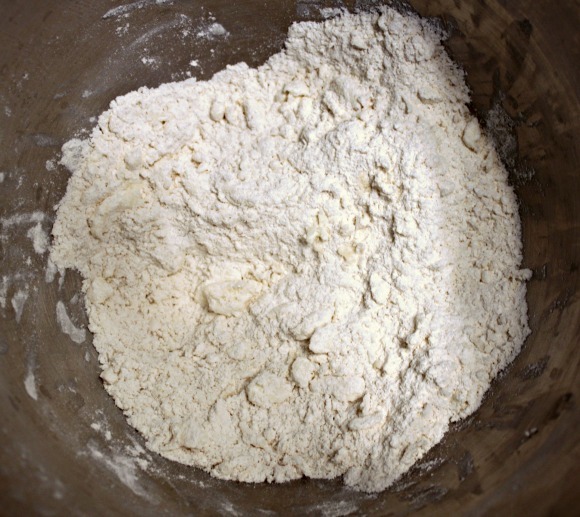 Add a little extra flour if your dough is too sticky. 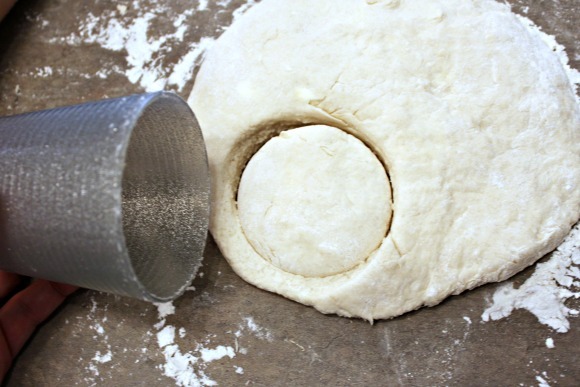 This doesn’t have to be perfect or even that pretty – just shoot for dough that’s about 1 ½ – 2 inches thick. Then you grab your cup and cut your biscuits out. 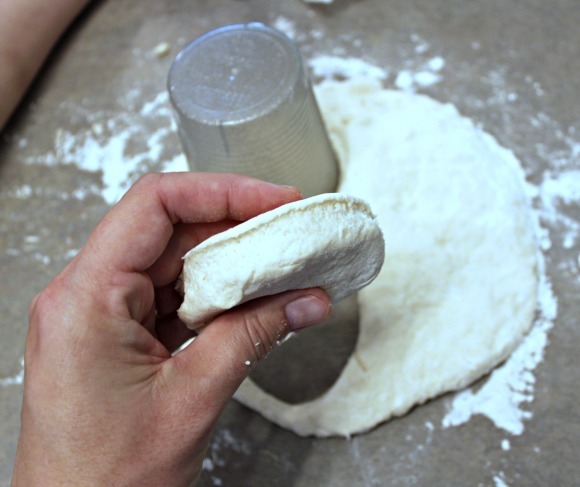 Cut as many as you can, then grab your scraps and re-form them into a circle and repeat your cutting until you’re out of dough. 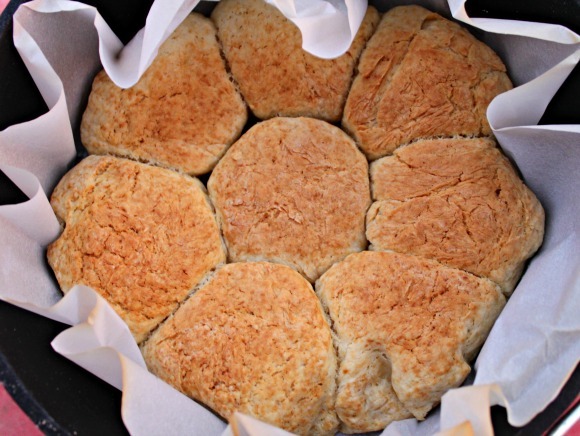 Place the biscuits in a single layer in your buttered/papered dutch oven. The single layer is important for them to cook evenly – if you’ve got extra – save them for another cooking session otherwise you’ll end up with gluey semi-baked biscuits. My recommendation is to simply check your biscuits every 20 minutes or so using either a lid lifter or a thick hot pad (trying not to get ash on those biscuits.) They’re done when they’re a lovely golden brown! 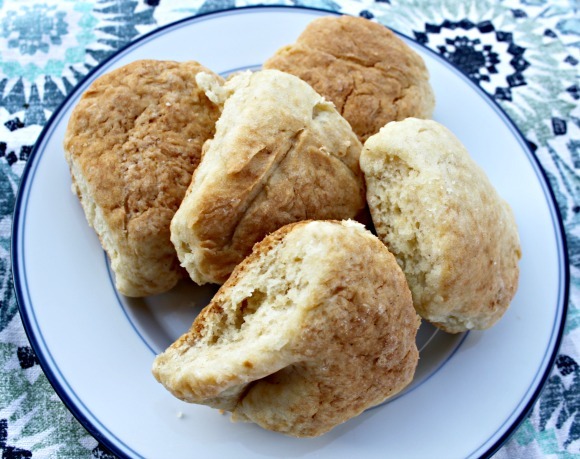 These biscuits are flaky and delicious! Grab some butter, honey, or jam and slather it on while they’re hot! I hope you enjoy these biscuits as much as we did! 2 1/4 CUP baking powder? Oops. Thanks for that. Corrected. Literally the first thing I’ve ever cooked in a dutch oven, and they are great. It was so much easier than I thought it would be! Thank you for a wonderful recipe. I think I’ll reduce the salt next time, though.